What started with simple RGB lighting on peripherals a few years ago, has grown into an entirely new market in itself. Gaming immersion seems to be Razer's theme this year at CES 2017 and they are showing two unique new product concepts that are sure meant to raise some eyebrows. 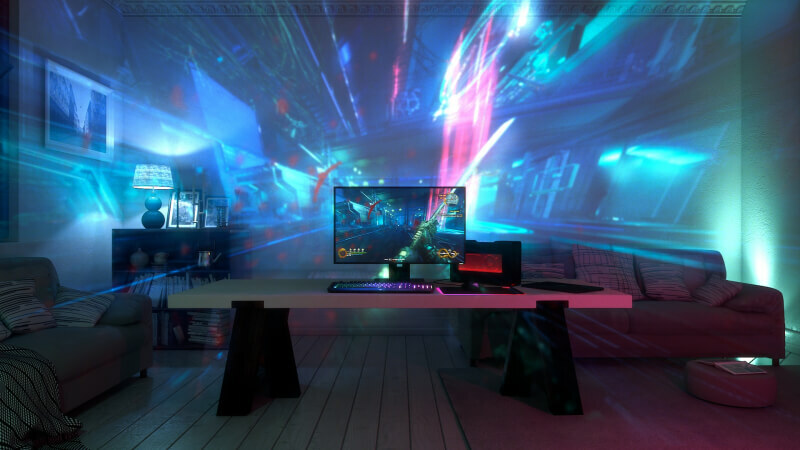 Project Valerie looks like someone just photoshopped two more monitors onto a gaming laptop, but Razer believes this will be a real product they'll offer in the near future. Based on the current Razer Blade Pro, the Valerie laptop features three 17.3 inch 4K G-Sync compatible monitors that automatically extend and swivel inwards for a 180 degree viewing environment. Content creators will appreciate the 100% Adobe RGB color accuracy and while not in use, the three displays will slide in behind the main screen. The body of the laptop features a unibody CNC aluminum chassis, weighing in at less than 12 pounds. No word on a price point or release date for this 12K resolution gaming laptop yet. The second prototype focuses on Razer's Chroma Lighting which has been made available to third parties for integration in games and future products. Building on this, Razer has created what they are calling a gaming projector. Project Ariana will consist of "video projection, multi-color lighting and the responsive intelligence of our Razer Chroma engine," said Razer CEO Min-Liang Tan. The projector will communicate with games in real time to create both lighting and video effects that will be projected onto a wall behind the computer. The projector features sensors that will scan the room first to create a layout, then using a fisheye lens, Ariana will display effects based on this profile. Whether or not total immersion is your thing, Razer does have some fairly unique products here. We'll be watching their evolution as they develop into actual offerings in the coming year or so.